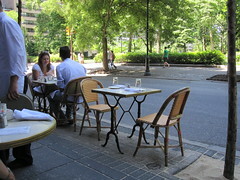 This picture of al fresco dining, illustrates the ambience of the Rittenhouse Square hotels. Should I Stay At One of the Rittenhouse Square Hotels? In order to answer that question, which is an excellent one, we have to divide Rittenhouse Square Hotels into two groups. The first is those that are actually located on Rittenhouse Square, and the second is those that are in the central Philadelphia business district, several blocks away. Rittenhouse Square - a name synonymous with refinement, culture, and architectural beauty for over a century in Philadelphia. Being west of Broad Street - the equivalent of "14th Street" - you will be relatively close to the Benjamin Franklin Parkway - and its many museums and cultural institutions. Or at least, closer than you'd be, if you were staying in Old City. Here is a list of some of the major Philadelphia tourist attractions, on the Parkway: the Museum of Art, the Rodin Museum, Logan Circle, the Franklin Institute, the Academy of Natural Sciences. That having been said, the closer you are to Rittenhouse Square, the further away from them, you are. So if they are your top priority, you want to stay as far north within this group, as possible. Note:The Park Hyatt at the Bellevue is actually on Broad Street, not west of it, and it is included in the Convention Center group also. One of the most prestigious hotels in the city. The Westin hotel chain is part of Starwood Hotels, the same chain which owns Sheraton. The Westin is really better classified as a downtown Philadelphia business hotel, as it is adjacent to Liberty Place - the skyscraper which, back in the 1980s, entered Philadelphia history by being the first building to exceed in height, the hat of the 37-foot-tall William Penn Statue at the top of Philadelphia City Hall - where you can take an elevator and walk around the brim of Billy Penn's Hat, and enjoy a breathtaking view of the city. You'd have to walk several blocks to get to Rittenhouse Square, so you're going to get a skyscraper ambience, not an urban oasis. The Latham Hotel is on the National Register of Historic Places. It sits on the site of the home of William Bucknell, a philanthropist best known for endowing Bucknell University in Pennsylvania. Built in 1907, this boutique hotel has European ambience. In 1915, it opened its doors as the Latham Apartment House, with fifteen stories. It remained as such until the 1960s, when investors - bucking the business trend of the era, namely converting hotels to condominiums - decided to convert the apartment house to the Latham Hotel. It officially opened to guests on August 15, 1970. Formerly known as the Rittenhouse Square Bed and Breakfast. The Hotel Sofitel is noteworthy, as it occupies the former home of the Philadelphia Stock Exchange. Owned by a Frenchman, the ambience is French, in a neighborhood known as Philadelphia's French Quarter, where French influence in architecture is prominent. Its restaurant is Chez Collette, which offers French cuisine, with a 1920s theme. Its bar, La Bourse, is currently being renovated. Superior Room, Luxury Room, Junior Suite, and Prestige Suite. Compared to the small, boutique Rittenhouse Square hotels, the Crowne Plaza is enormous. It has 445 guest rooms and is located in a sleek modern building on Market Street, in the heart of the business district. Accordingly, its ambience is much more business, skyscraper Philadelphia, than French Quarter elegance. We particularly recommend the Elephant & Castle, the English pub-style restaurant contained within the Crowne Plaza Philadelphia. The food is excellent and the prices reasonable, and the English-pub ambience provides a cozy setting for a meal. It also has the advantage of being located close to Suburban Station. If you have the cash and/or the expense account, you can't go wrong with The Rittenhouse Hotel, which sits literally on Rittenhouse Square. It comes with stellar ratings, from those who are in the know. In 2010, Travel and Leisure Magazine, when it compiled its Top 100 list, rated The Rittenhouse Hotel as the #52 hotel not just in America, but in the entire world! We wouldn't recommend it for pleasure travelers, given its expense, but otherwise, go for it. Lippincott House, located just a single block off Rittenhouse Square, offers turn-of-the-20th-century charm. It began its existence in 1897 as a mansion, and now fuses the days of yore with the needs of the 21st century traveler. Its interior has a wall mural painted in 1902, and an 1887 grand piano, which is still played. The main fireplace in the common room is made of hand carved mahogany. All of its rooms have the unique combination of a fireplace and wireless Internet connections. For entertainment, Lippincott House also offers Victorian-style Murder Mystery events, the themes of which change, according to the season. If you'd like to leave Rittenhouse Square Hotels, and return to the Home Page of Enjoying Philadelphia, please click here.